Well the second day skiing is over. This day I did both red and black runs! I cant believe that I managed to do black runs on my second day. Must be the quality of the teaching. Fredrik was awesome. Tack så mycket! I was all a lot of fun and my legs felt a lot better than they did the first day. Bring on Åre! Åre is the most famous place in Sweden for Skiing so it should be fantastic when I get there. Had a good morning with work, fixed up a customer installation here in Uppsala and my train was on-time (a minor miracle in my life at the moment, Jag hatar SJ I hate the train company) The Swedish is going well. I feel OK most of the time but need help every few sentences. I also follow most of what people say but occasionally get a little lost. Give me a few more months! Sweden just won their Davis Cup tie against Brasil and this brings them up against the might of Australian Tennis, Little Ley Ley, The Poo, Woody and the boys! It is going to be played in Sweden down in Malmö but I will be off to the US. DAMN!!!! What I would have done to be there spurring the boys on. Making an absolute true blue dickhead out of myself. I would have tried to teach the blow-ins a few chants in Swedish to put it up the locals. Would have been fun! Oh well Ill have to make do with giving them stick when I get back. Got to go, pulling into the station! 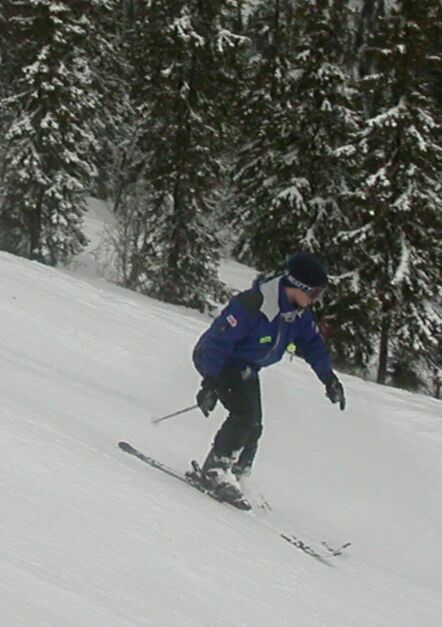 Me on a black run!